oh by the way I called that big white thing the dominator, suposed to have a rail gun and hidden missile pods. 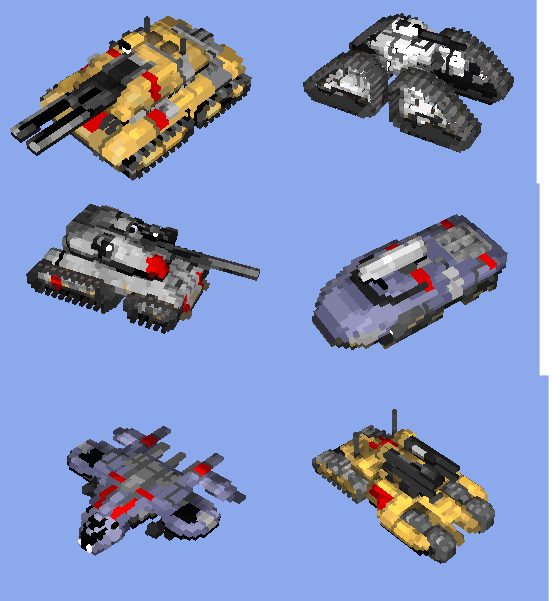 in order left to right Heavy tank, dominator, medium tank, lightning scout, heavy gunship and flak tank. Also... sorry I didnt get any ingames, it was due to the deadness of the mod. I really like these! Original and very cool! Could I see in-games, please? The main one I'm interested in is the Nod schemed tank in the top right. In a short note, make sure the topic name provides a better description of the included voxels. (I've edited it this time). Well it's always sad to see assets like these go public.. I love the gunship (though IMO it looks more like a carryall) and the flak tank, though the rest is equally beautiful. I agree with the spotlight suggestion. I agree. Definately Spotlight worthy! I Agree now that I've saw the in-games. Spotlight! Deffinatly. Thanks for the ingame team black... I never noticed but there are still a few things I didnt fix on the lightning scout, medium tank and heavy tank. Also the lightning scout is supposed to be a hover unit. Oh and this is my first spotlight thanks. There are truly brilliant, nice original voxels, and good colouring. Well done, man. But I don't use TS sized voxels. i love those voxels, they're good. good job L()KI. I disagree, most mods are overrun with quality work these days, public domain veoxels and SHP's, especially good ones, are very very lacking, and more is certainy a good thing. I dunno if anyone's covered the really important parts, but, how do you get a custom unit (like the Dominator) to show up in the game, let alone buildable? I followed the tutorial, yet it just doesn't happen. This really covers everything you want to know, It's one of the most useful (If not THE most useful) tutorial on PPM. RAWR that was the second one I linked to. The third one you linked to you mean, I was merely stating that LKO's tutorial is pretty much all you need to know in one thread.